I initially planned skipping Hualien on this trip. 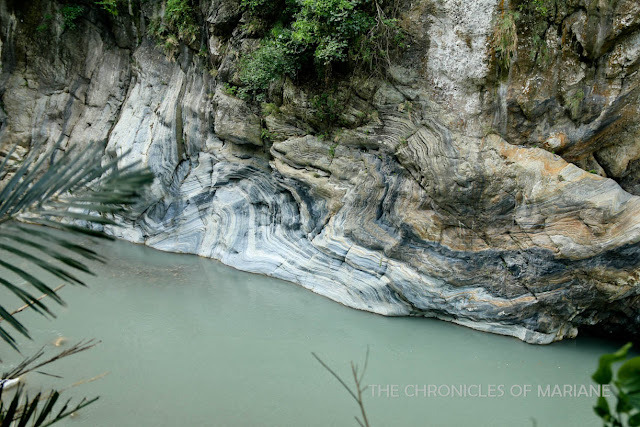 When I was searching for recommended sights in Taiwan however, every site that I have seen consistently recommended Taroko Gorge, as a matter of fact, it topped most lists. I have seen pictures and blogs of people who have been there but I was not impressed. 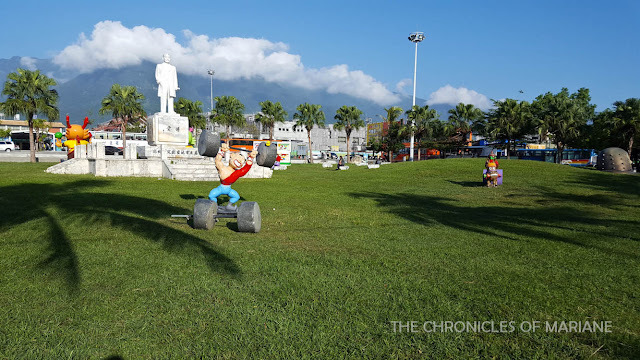 I had a change of heart when I was in Kaohsiung, I intended to take a bus to Kenting but thought “forget it, I’m giving Hualien a chance.” And my friends, this is the story of how Hualien became one of my favorite counties in Taiwan. 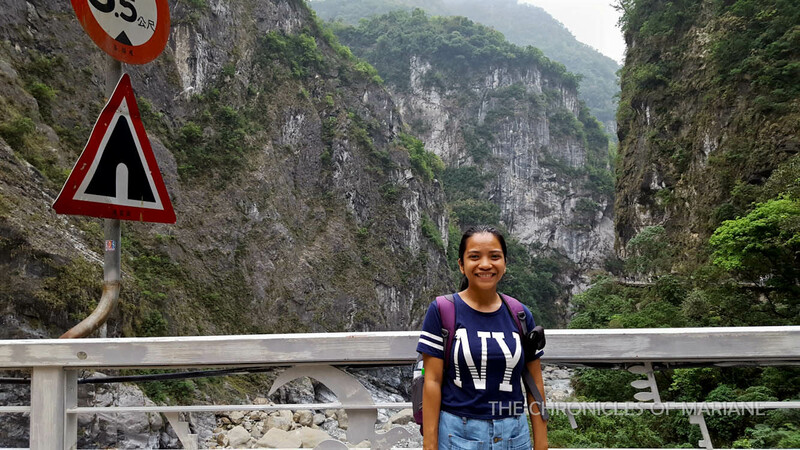 So what made me fall in love with Hualien? 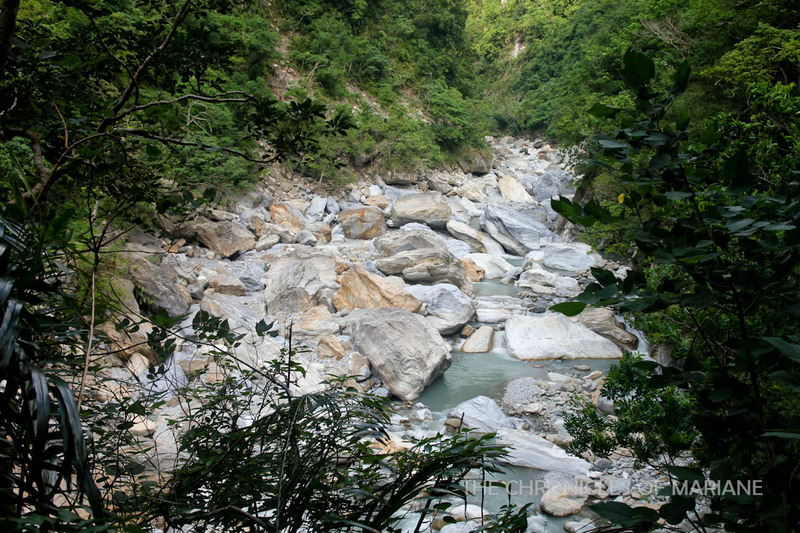 One of the reasons is Taroko Gorge National Park. It’s crazy how uninterested I was about this place before coming to Taiwan, and how my mind did a 180 degree flip after finally seeing its beauty. 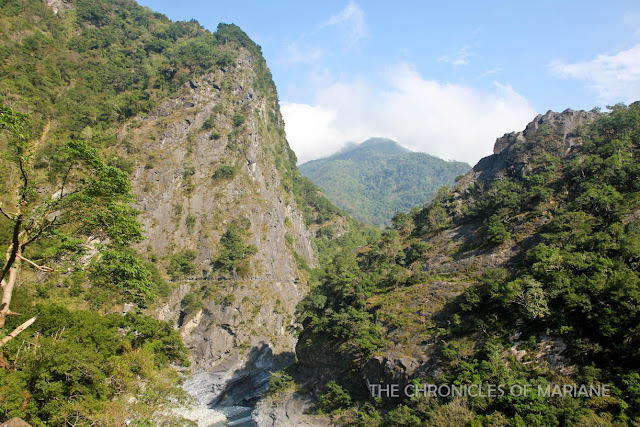 But first things first, let me tell you something about Taroko National Park. 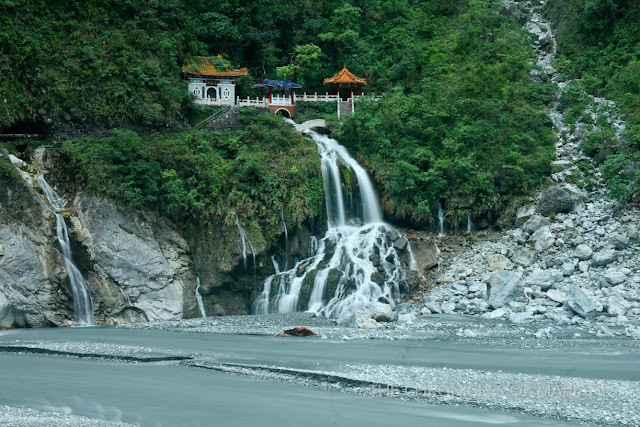 Located east of Taiwan, Taroko National Park 太魯閣國家公園 is one of the eight national parks in the country known for its tall mountains, roaring waterfalls, lush forests, ginormous marble rocks and its wonderful gorges that overall make for a breathtaking scenery. It spans an area of 92,000 hectares and is extends not only over Hualien but to Nantou and Taichung as well. 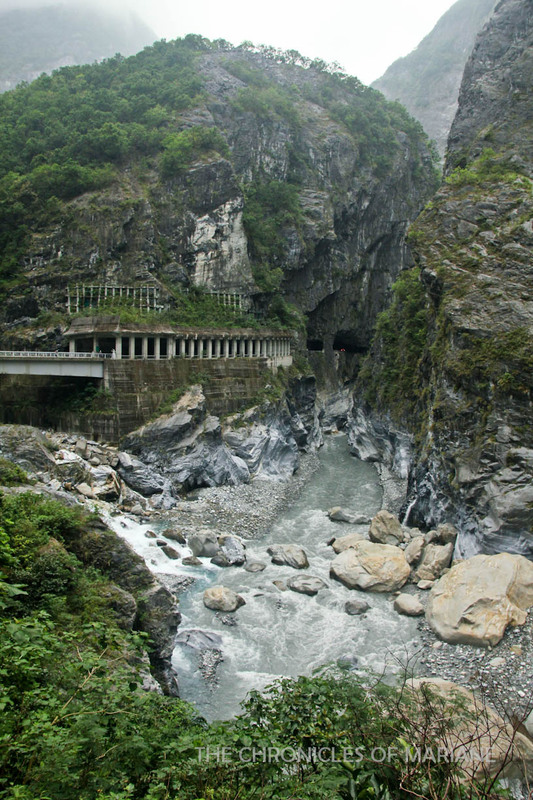 Its name, Taroko, means “magnificent and beautiful” derived from the word Truku from the local dialect of the aboriginal Truku tribe. Hualien is the entry point to the scenic spots around Taroko, so you must find a way to get to this county first. Of course, it would be easier if you could afford to join organized group tours, but then again, doing it DIY-style is more fun, would you agree? 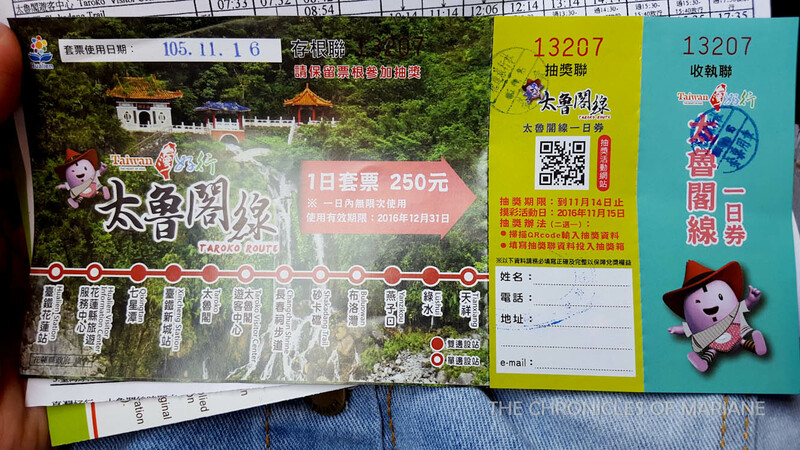 I think it will be doable to do a day trip from Taipei to Hualien, but you just have to be super early and be on time so as not to miss your train. I suggest taking the 06:20 Tze-Chiang which only takes two hours. The next train which leaves at 06:30 has more stops I suppose, so you’ll get to Hualien after three hours. See? A couple of minutes makes all the difference. The trip costs 440 NTD. 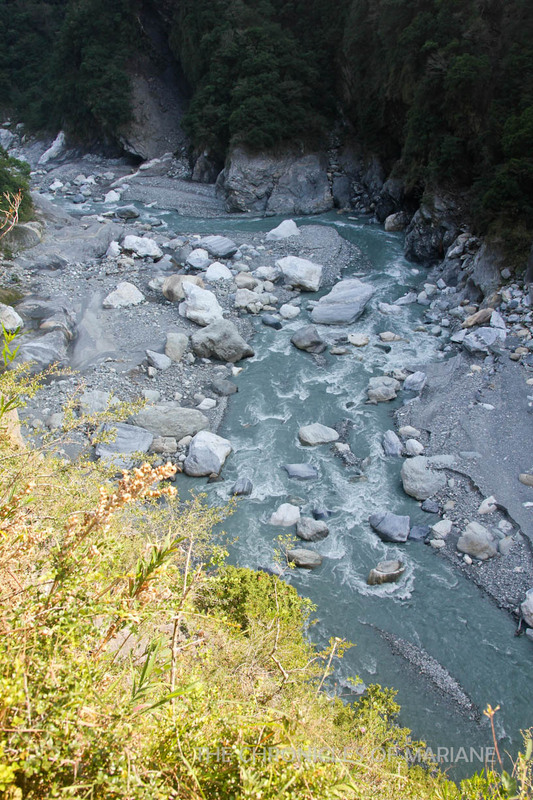 There are some people who would recommend that you alight at Xincheng Station, but Hualien has more schedules and the shuttle bus ticket is only sold at Hualien Station. The bus however, would also pick up passengers at Xincheng. Good news, there’s also a direct trip from Kaohsiung to Hualien, so no need to change trains. 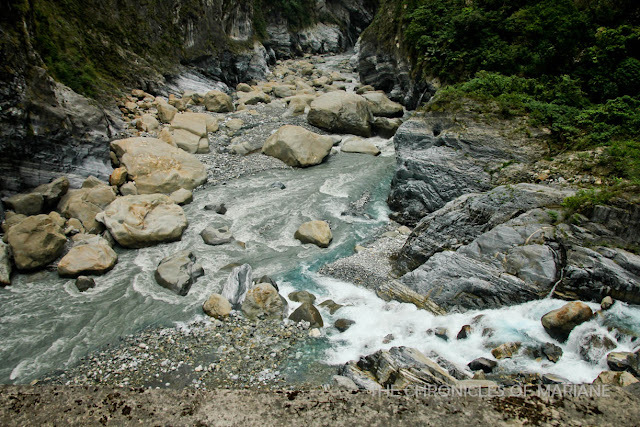 Now that you are in Hualien, how do you get to Taroko Gorge? Again, you can just rent a cab which is easier and faster. But for those who do not have the luxury of money (like me), I’ll teach you my ways. There’s a tourist shuttle bus that stops at almost all the important sights in the park. The main stop is a few steps away from Hualien Railway Station. From the exit, it’s at the left side. There might be unpredictable changes in the schedule so I suggest checking out Taroko’s website, they post the Taroko Route Shuttle bus schedule there as well. Hualien also has a Visitor Center which you will also pass by as you exit the station, so you can inquire and use the resources they have available. Earliest bus to the park is at 06:30 AM and the last bus back to the train station is 06:00 PM. 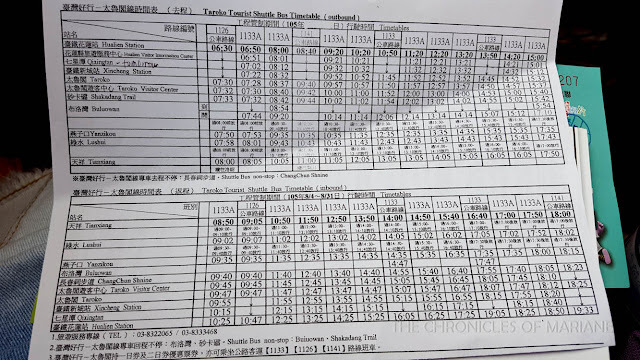 As of November 2016, the one-day unlimited bus travel is 250 NTD while the two-day pass is at 400 NTD. Single fares can be paid but might vary depending on where you stop, I suggest getting this deal as you’d likely be going on to different sections of the park anyway. They would also give you a timetable of the buses, keep it! As you may know, this is a mountainous area, so landslides and other accidents are usual occurrence. Be safe and prepared, especially during bad weather. 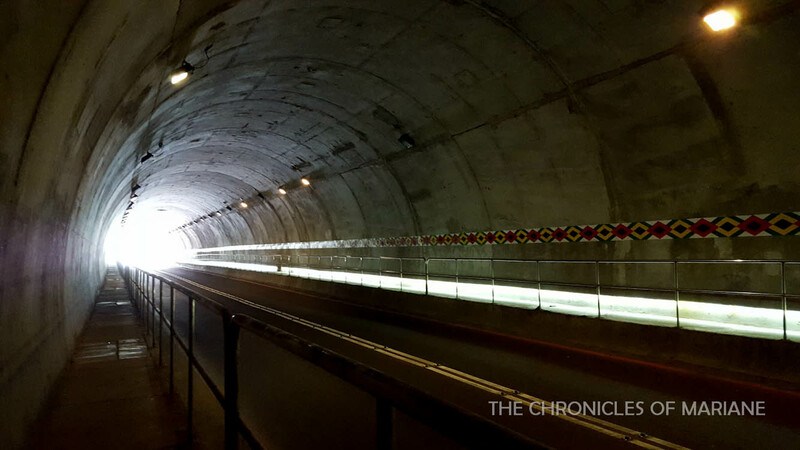 It seems like the Jiuqudong Trail or Tunnel of Nine Turns have closed indefinitely due to typhoon damage. You could also inquire about this at the Taroko Visitor Center, there is at least one staff that speaks English, maps are also available. You can also gauge your time more by knowing the popular hiking trails. So you can estimate how much time you need and how much distance is required per trail. 4. Some trails might require fees or permits, do check at the center or at the website. 5. Wear comfortable clothes because you’ll mostly be walking. 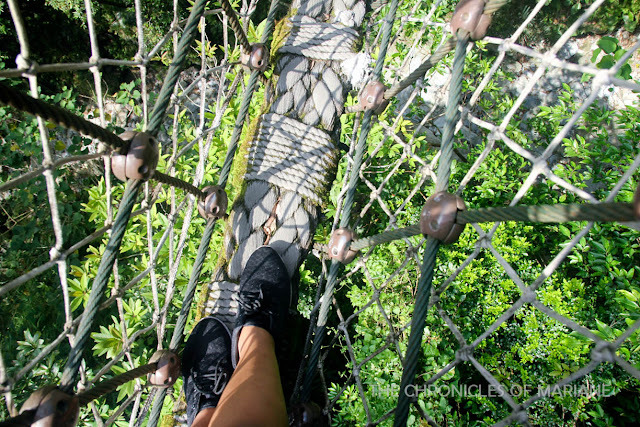 You don’t necessarily have to wear hiking shoes, bringing a windbreaker or raincoat is a good idea since the weather might change from time to time. 6. And most important of all, BRING FOOD AND DRINKS. There are almost only few shops around the park and the most accessible ones would be the least cheap of all. There is only one canteen at the visitor center and the decent meals there are priced at around 250 NTD (ouch!) Cheaper eateries are located at Tianxiang which is almost at the end of the bus route. Again, the bus schedule can also be found in this link. The bus would take you around Qixing Beach, Xincheng Station, Taroko Visitor Center and to its beautiful sites – Shakadang, Bulouwan, Yanzikou, Lushui and Tianxiang. Make sure to hail for the bus by raising your hand and waiting at the right bus stops, otherwise, the bus will not stop for you. 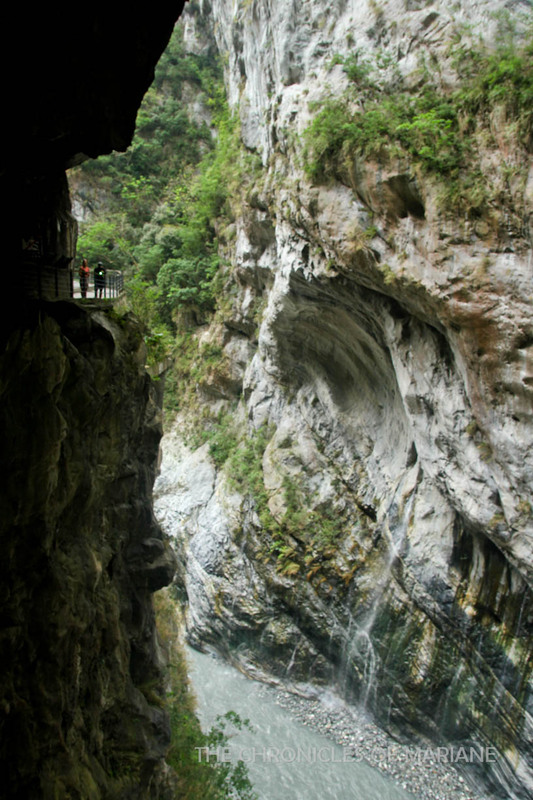 Please note that some places like Qingshui Cliff is not reachable by bus, so if you would like to see this place, it is advisable to take a taxi from the Visitor Center. I’ll be making a separate post on how you can access this place by public transport. I feel like I have seen the highlights of the park, however since there were some trails that were closed to the public, I was left hoping for more. There were also various spots that were not reachable by bus, like Qingshui Cliff, which I opted to visit the following day. I suggest spending two days around the park so you don’t feel rushed and you’ll have more time to explore. 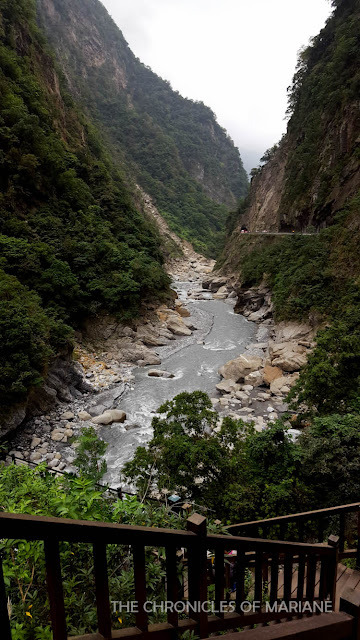 I alighted at Taroko Visitor Center and was able to get some needed information about the park, however the bus heading to Tianxiang would not arrive after an hour so I just decided to walk to Shakadang. 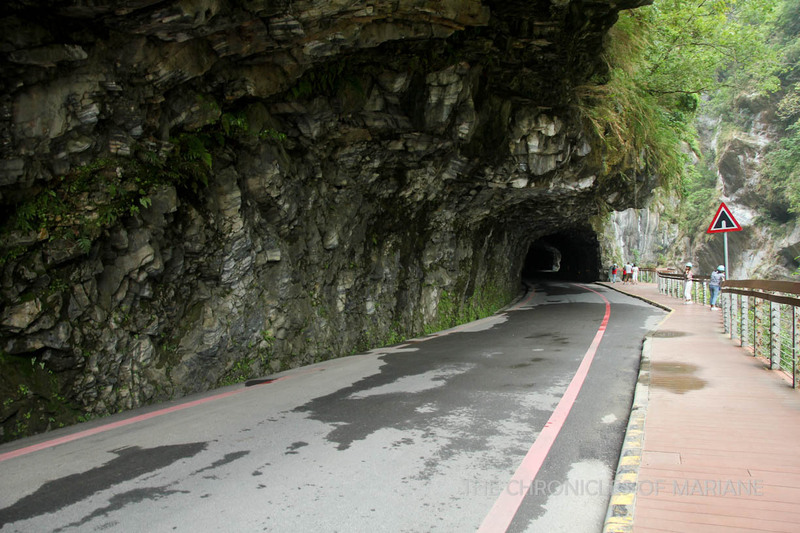 It was then that I noticed this small opening at the tunnel which leads to Xiaozhuili or Little Zhuili Trail. It was an incredible primer to Taroko Gorge, the first thing I saw was mountain ranges surrounded in mist with birds singing in the background. It was so magical.. it looked like a scene in some movie. The mist was gone in a matter of minutes and I was too late to capture the scenery, but the fleeting moment will stay in my memories for sure. It’s mostly just deep trees as you move forward through the trail, but accompanied with the rushing sounds from the Liwu River in the background, you’d feel like you’re one with nature. 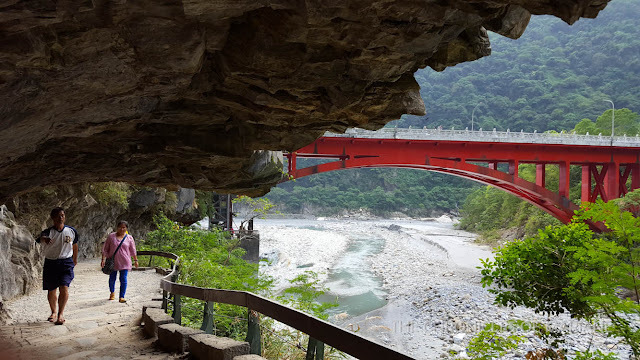 As I reached the end of the trail, I was greeted by a sign welcoming me to Shakadang Trail 砂卡噹步道, a 4.4 kilometer flat footpath that follows Shakadang River which is famed for its sheer blue water. It was previously called as the “Mysterious Valley Trail” because locals thought it looked secretive. 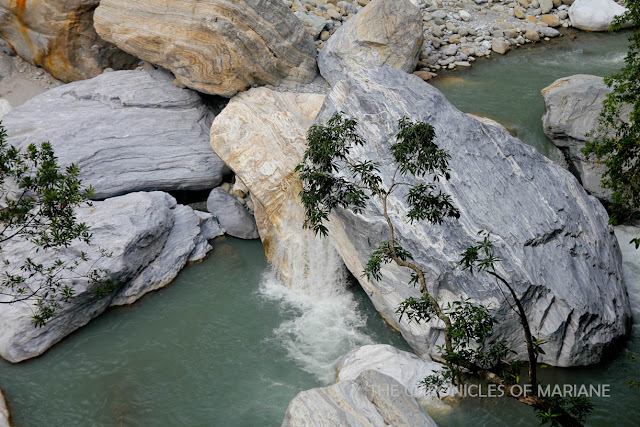 I wasn’t able to discover the secret this area lies but I know for sure that for every turn, you’d be surprised by gorgeous views of tremendous marble cliffs. This is a pretty easy trek so expect the area to be crowded, I was joined by lively grade school children who offered me snacks. When people offer to take a picture of you, of course you oblige! This was a first! I was feeling really famished and have felt the consequence of not bringing enough food for this trip. I didn’t know I’d feel this hungry from all that walking. Even though it was not on my plan, a friendly Taiwanese suggested I head to Tianxiang 天祥風景區, the recreational area of the park. True enough, I was able to find an affordable place to eat, and who would have thought you’d spot a 7-11 on the mountains. For those hoping to stay overnight at the park, there is also a hotel in the area. I was hoping to make it to the seven-tiered Tianfeng Pagoda and Xiangde Temple but the path going up was blocked that time, which was good timing, because I would have missed the bus and would have waited for an hour before another one comes back. I was told that Tianxiang is also the bus stop for the Baiyang Waterfall trail, however, it was also off-limits to visitors that time due to some damage from the rain. Another unplanned spot was Lushui Trail 綠水步道, I was enthralled by its name so I decided to get off the bus and follow where the tourists are headed to. A relatively short hike navigating through the Cross-Hehuan Mountain Road that was built by the Japanese. 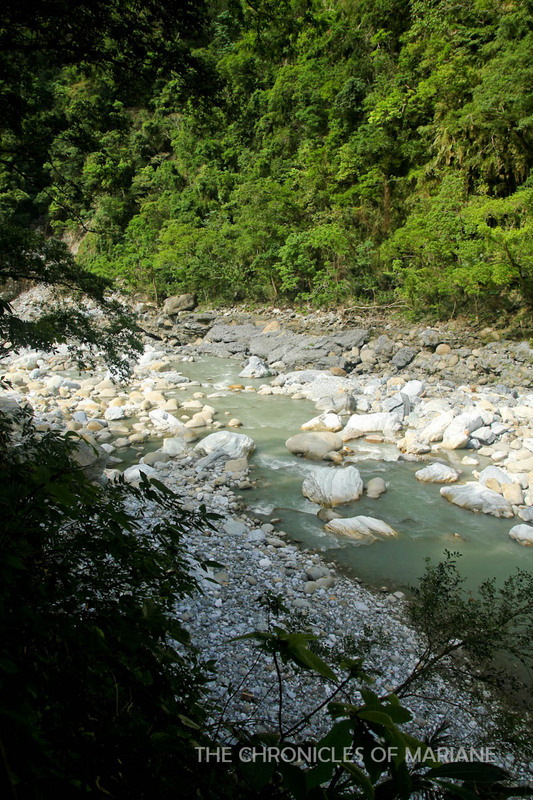 It was once home to the aboriginal Taroko tribe. 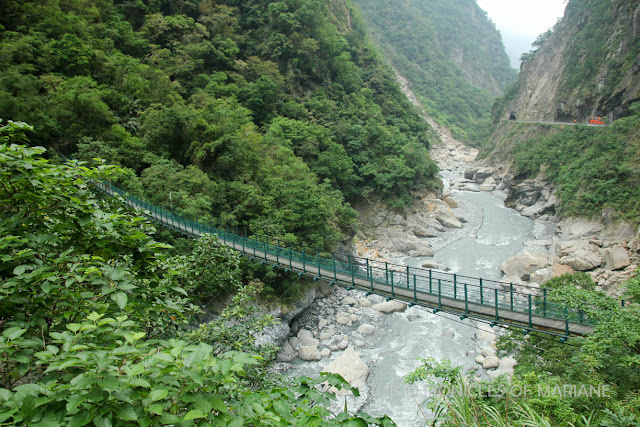 It takes about one-hour one way and promises of stunning views of Liwu River and a rich ecosystem. However, please note that there is no bus stop at the end of the trail (Heliu), so I had to walk back and find one nearby. My personal favorite among all the trails and sightseeing spots is the Swallow Grotto or Yanzikou 燕子口. This area has some of the most amazing panoramic views of the marble gorges that runs through the powerful Liwu River. This is a 1.5km trail that crosses the old Central Cross-Island Highway so you need to be cautious of cars and buses passing through. There were some areas wherein you’d be going through a series of tunnels so I recommend bringing a flashlight. I noticed that most tourists were wearing hard hats, most likely provided by tour guides. I reached the Jinheng Bridge, named to pay tribute to Chief Engineer Jin Jeng who died when he was on his way to inspect the damage created by an earthquake in 1957. It was already dark when I decided I had to catch a bus to my last destination or I wouldn’t be able to get back to the city center and get stuck here. By the time I arrived at Eternal Springs Shrine 長春祠, it was already hard to navigate around given that there were very few lampposts on the area, so I was only able to take a picture of the shrine and couldn’t make the hike all the way up. 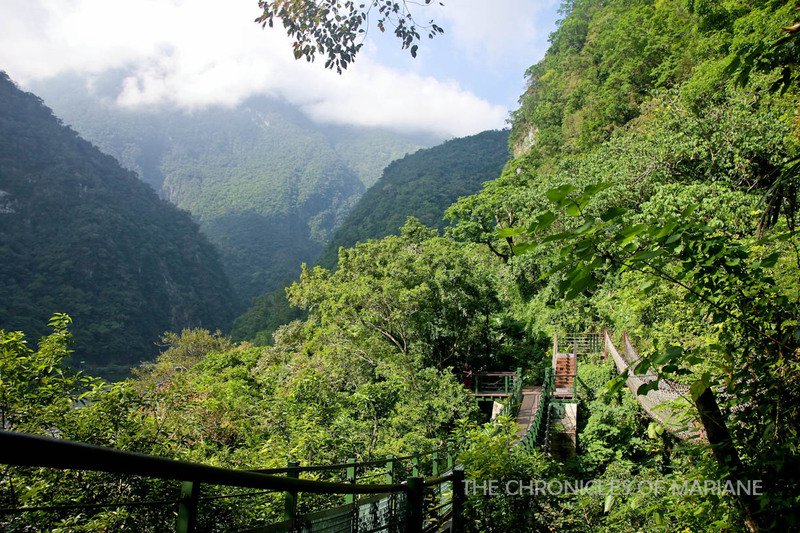 If I came there earlier, I would have been able to see the shrine, the Taroko Tower and Changuang Temple. Also called as Changchun Shrine, it was dedicated to the 226 veterans who passed away during the Central Cross-Island Highway’s construction in the late 1950s. It is a very popular spot in Taroko for its adjoining rivers that forms a waterfall, which the locals have named the Changchun Falls. 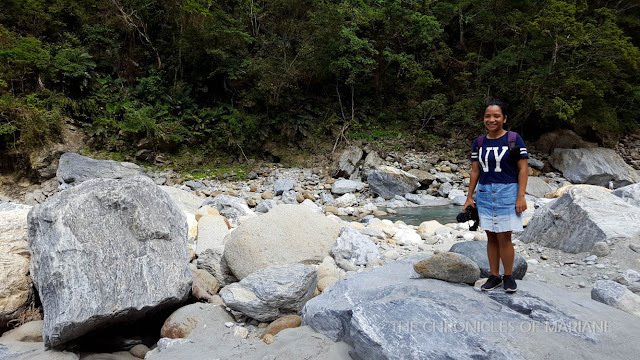 I decided to make this my last stop as the bus from Hualien doesn’t stop here, even though it is just located a few minutes away from the Visitor Center. 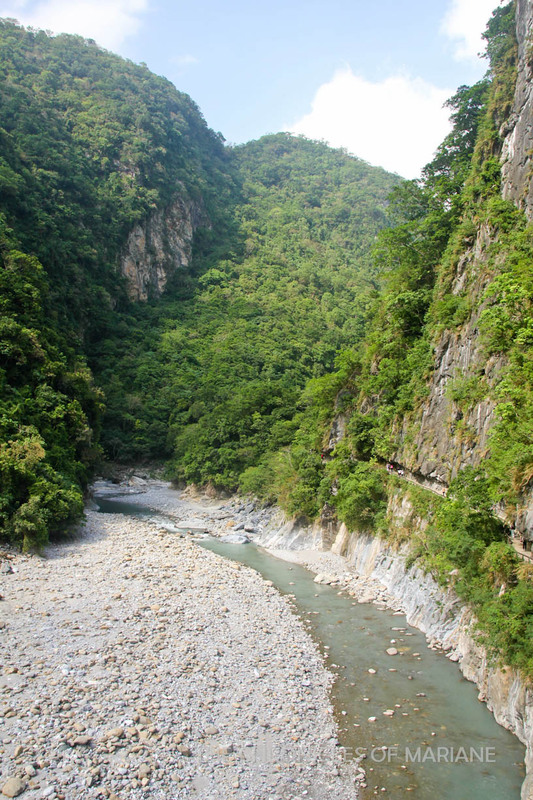 Needless to say, I enjoyed by time around Taroko Gorge National Park. However, there were still some sites that I was not able to visit since some were closed to the public at the time of my trip and for some, I just didn’t have enough time. 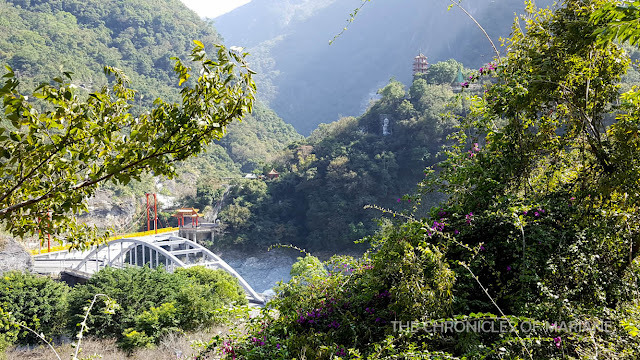 Baiyang Waterfall Trail is a 2-kilometer path originally made by the Taiwan Power Company with plans to potentially foster hydroelectric power in the country, however it was cancelled eventually, and now the seven tunnels connect tourists to amazing vies of water curtains. The Tunnel of Nine Turns Trail or Jiuqudong is said to be the most stunning area in the park, however it has been deemed to be hazardous and so it has been closed for some years now. I could only wonder how it looks like. I tried to make some time for Buluowan 布洛灣, but it was either I eat or go here, so you know what I chose. 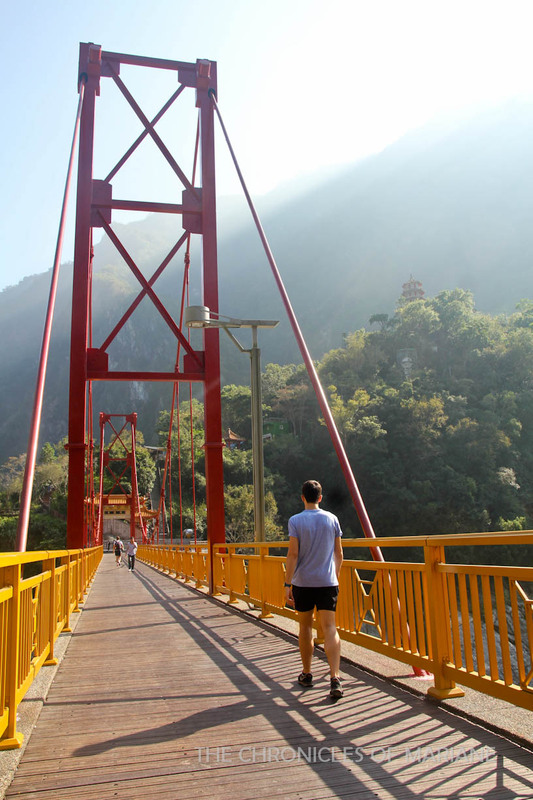 again, I was approached by a Taiwanese driver if I would want to have my picture taken on the bridge. How friendly could these people be? this is super helpful! 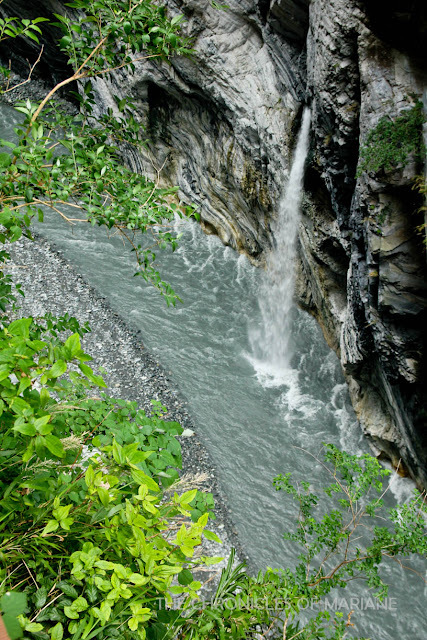 we'll be going to Taroko by the end of the month. for a group of five would you recommend hiring a car or doing it DIY? Hi Mariane! 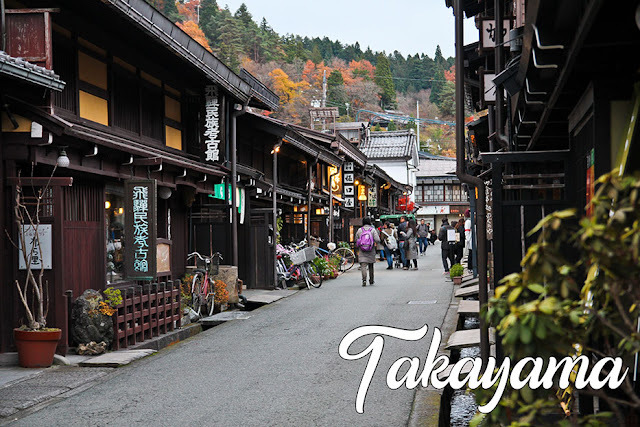 Thanks for sharing about your Taiwan trip. 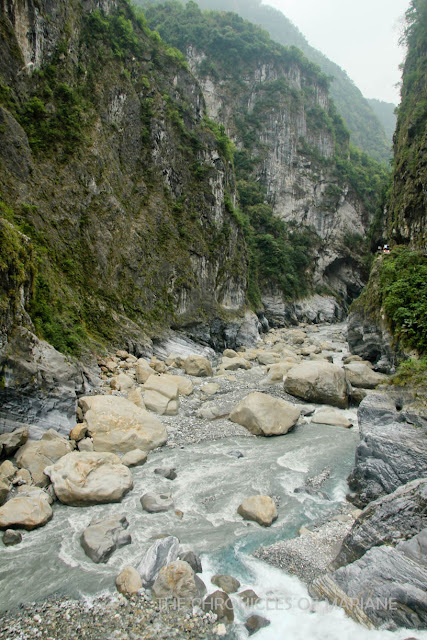 Taroko is on my to-go list...and someday I wish to follow your footsteps around Taiwan. I hope you will share your itinerary as part of your Taiwan series! Thanks! Heyyy!!! Hope you can go soon, both Cebupac and Air Asia have cheap promotional fares :) TW is super nice and hope I can go back soon! Hi! Can I ask where did you buy your One-day bus ticket? From Hualien Rail Station?